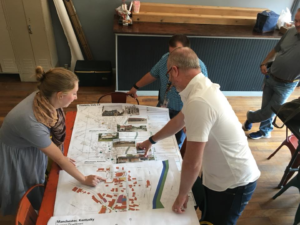 After an in-depth field study, landscape design students from the University of Kentucky discussed their analysis of downtown Manchester, Kentucky in a recent meeting. Their study included recommendations for building restoration, traffic flows, parking and community gathering locations. Downtown revitalization has been shown to spark renewed interest in civic engagement, promote small businesses and improve the quality of life for citizens. Their work was made possible by an ARC Power grant obtained by CEDIK as the lead entity.